birthstone is a garnet, I thought I'd make red-themed gifts to go with her birthstone. These square self-closing favor boxes are available at Taylored Expressions. The one I used here is Blush Red Dark. Taylor has a HUGE selection of boxes and colors that you can see HERE. They're awesome little boxes...pre-cut, scored and ready to go. I added some Daisy D's polka dot DP to the box when it was laying flat on the table, added some sticky tape to the inside tab of the box, folded it up, and filled the box with some cherry-flavored Swedish Fish candy (yum!!). 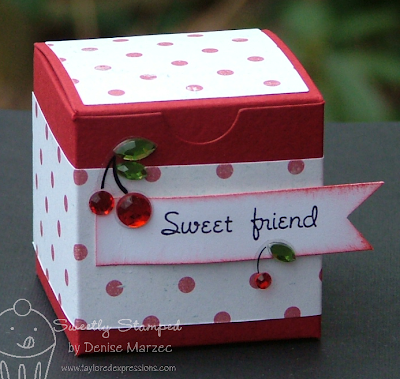 I stamped the Sweet Friend sentiment from the SASI Sweet Celebration set onto white CS, cut it out, punched the flag end by using a square punch on an angle, and then sponged Riding Hood Red ink around the edges. I glued down the left edge of the sentiment with more sticky tape and then the right side is glued down with some Dimensionals to give it a little curve. Don't forget, the new Valentine's SASI stamps are being released THIS FRIDAY and sneak peeks have started today on everyone's blogs!! Here are links so you can do some blog hopping: Ana, Carol, Charmaine, Donna, Jami, Jen, Laurie, Monika, Sharon, Steph, Terri, Taylor....and me! This is so super sweet Denise! I keep thinking I need some of those blingy cherries - it's awesome how they really can make a project! DARLING!! Gonna have to look those babies up for sure!! This is awesome...love the little cherry bling!! And I love swedish fish...I had to quit buying the huge bags because I'd eat them all!! This is absolutely ADORABLE, Denise! I LOVE those cherries! Pretty box Denise. Love the paper. TFS!